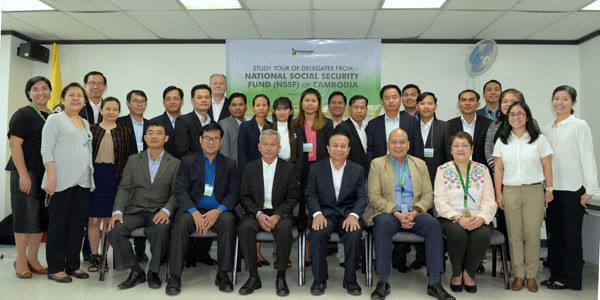 SIXTEEN (16) delegates from the National Social Security Fund (NSSF) of Cambodia are here in the Philippines this week to learn more about the Philippine experience in implementing the social health insurance program and providing coverage for the informal sector worker. Ruben John A. Basa, Executive Vice President and Chief Operating Officer of the Philippine Health Insurance Corporation (PhilHealth) welcomed the delegates headed by Dr. Sum Sophorn, Deputy Director of NSSF, in behalf of Interim/OIC, President and CEO Dr. Celestina Ma. Jude P. De la Serna. Sophorn thanked PhilHealth officers and staff for granting their request for a study visit in the Philippines. “As the NSSF of Cambodia already implements our own public health insurance that covers the formal labor sector workers, this time, we are particularly interested in covering the informal sector worker starting this year and we believe we can learn more about the Social Health Insurance system in your country,” he said. Present during the opening ceremony at the PhilHealth Head Office in Pasig City were Jovita Aragona, Chief Information Officer; Nerissa Santiago, OIC-Senior Vice President and Concurrent Vice President for Actuarial Services and Risk Management Sector; Dr. Francisco Soria, Jr., OIC-SVP for Health Finance Policy Sector; Dr. Narisa Portia Sugay, OIC-Vice President for Member Management Group; Chona Yap, Senior Manager for Overseas Filipinos Program; Dr. Melanie Santillan, OIC-Senior Manager for Benefits Development and Research Department; and Vergil de Claro, Division Chief – Corporate Planning Department. The Cambodian delegation will be in town for four days. The study visit began with a two-day discussion on topics such as the NHIP Story and Strategic Directions, PhilHealth Today – Bigger and Better Membership Programs by Virtue of RA 10606, PhilHealth Benefits and Availment of Services, Benefits Development and Accreditation of Health Care Providers, Actuarial Process and Valuation, PhilHealth Enterprise Architecture, Getting the Message Across – Communicating and Advocating NHIP, and the PhilHealth Feedback Mechanism. The delegates will also visit the Local Government Unit and Health Facilities as well as the PhilHealth Local Health Insurance Office in Calamba, Laguna to observe first-hand how the NHIP works. Arsenia Torres, Senior Manager of PhilHealth’s Social Health Insurance Academy (SHIA) emphasized the importance of the study visit, citing the delegates’ need to explore and appreciate the NHIP and how it has become a success driver towards the Philippines’ quest for universal health coverage. The study visit is the first for PhilHealth this year and the SHIA is expecting more delegates from other countries to learn more about social health insurance, the PhilHealth way.